Cumberland Island (a barrier island off the state of Georgia’s, US, southeast coast )is one of a handful of places on the East Coast that are home to bands of feral horses. The horses on Cumberland Island may have similar ancestors to the Chincoteague/Assateague ponies, which are thought to have been either shipwrecked or abandoned there by Spanish explorers in the 1500s. Plantation owners, various military activities, and influxes of pleasure horses brought by the island's more recent residents blended into the population over the centuries, resulting in a horse that's still very tough, but not as stubby and fuzzy as its cousins to the North. It's not unusual for the Cumberland horses to reach 15 hands (5 feet tall at the shoulder), and they are longer legged and longer backed than other East Coast feral horses. 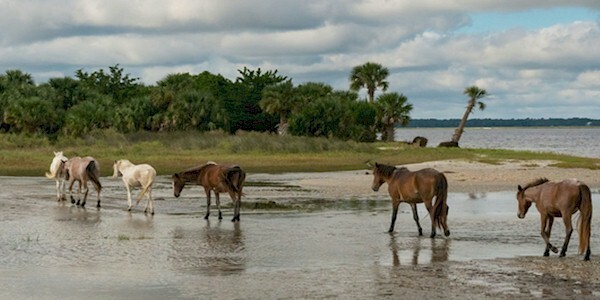 Currently about 150 horses live on Cumberland island, and without any significant predators, the population is growing. Visitors to the island delight in the way the horses splash along the beaches and peacefully graze in scenic spots like the ruins of the Dungeness mansion. However, many conservationists and local folks concerned about the island's pristine beauty see the horse as an invasive non-native species.They eat sea oats and beach grasses that are scarce to begin with, and are critical to preventing dune erosion. They also tend to trample delicate foliage in the marshy areas. There are those, too, for whom the horses' well-being is the main concern, and life on Cumberland is no picnic, even though the animals have managed to tough it out for centuries. Competition for food can be intense, and the herds are often beset with parasites and other diseases. Sand colic, a painful and sometimes fatal condition caused by the ingestion of sand which collects in the horse's delicate digestive system, is a common problem when horses are grazing along the sea shore. There was some effort to thin the herds in the early 1970s when they numbered in the hundreds, but since then the National Park Service has not interfered with the population. In recent years, as more attention has been given to the effect of the horses on the fragile island ecosystem, the Park has been exploring a number of options to find a balance between the island's ecological requirements and the spirit and history that the horses bring to its sandy shores, windswept dunes and cool shady lawns.